The Guardian has a slide-show of unsold car stocks around the world, arrayed in vast, serial forms, troubling landscapes of overaccumulation. 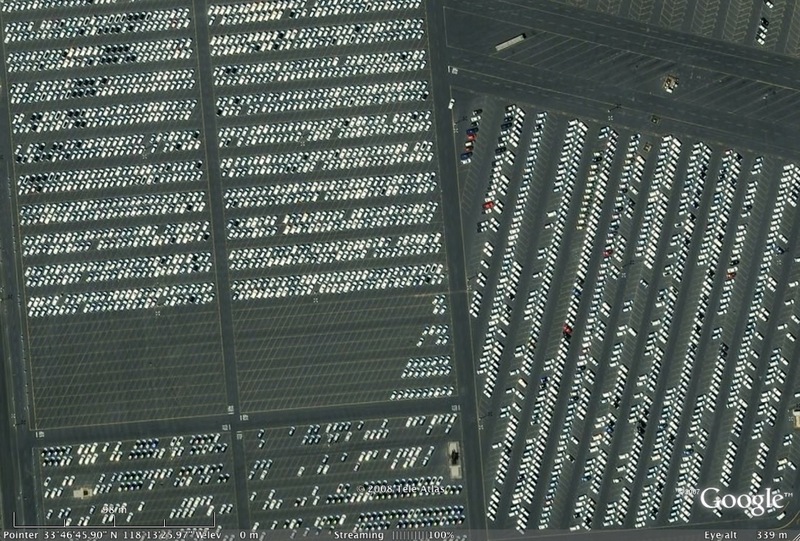 Like the image of the Los Angeles ports above, which I retrieved via Google Earth, they seem like some strange take on Ed Ruscha’s parking lots. Ruscha saw those lots as a “a machine for the production of oil-spots,” a fleeting and abstract residual artistic form. The cars in these photos are more interesting in the fact that they are still there, rather than what they have left behind. This entry was posted on Tuesday, January 20th, 2009 at 10:43 am	and is filed under Etc., Traffic Culture. You can follow any responses to this entry through the RSS 2.0 feed. Both comments and pings are currently closed.